There's just something about a long road-trip (especially one that consists of vast, end-of-the-world desert landscape) that makes me feel like it's our little family of four against the world. Negotiating car music selections, minor squabbles, horrible gas station bathrooms, car sickness, and potential side of the road breakdowns (all of which actually happened) become battles to fight together. We're a unit, trying to keep calm and figure it out. It's fortifying stuff I tell ya. We also had fun once we stopped the car and actually arrived in Marfa. Think: Donald Judd house tour, dinner at Buck and Camp's magical house, rooftop star gazing, Dan Falvin light sculpture frolicking, Food Shark eats, afternoon naps during afternoon rainstorms, margarita swilling, Marfa lights spotting, bike riding, icy spring swimming, a perfect meal at Cochineal, farmer's market perusing, collecting all manner of natural treasures (basalt lined rocks, tumbleweeds, smashed pennies, a perfect iridescent green beetle), plus loads of imaginary play by the girlies and their friend H, including the creation of their genius fictitious band, "Marfa Stewart and the Chinatis". Now we're back to real life with its schedule wrangling and commitments and responsibilities. I'm in the (crazy) two week stretch before we send D Moms to press, the girlies are getting geared up for the new school year (excited, scared, excited), we're planning Audrey's upcoming birthday party... All good stuff for sure. But I'm not going to lie. I wish we were back in Marfa. 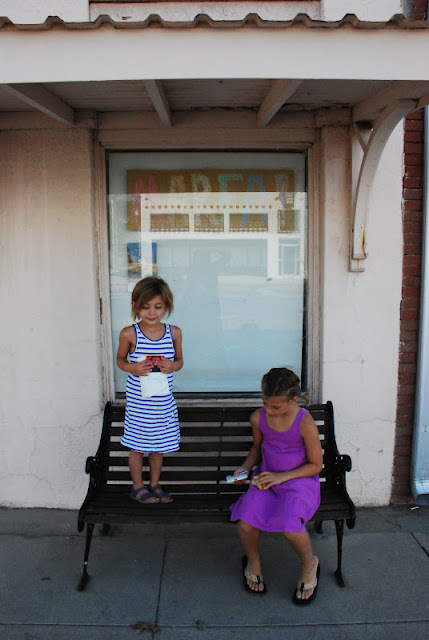 marfa is SO awesome and it looks like you + your fam had a great time. i wish i was back there too...trying to figure out a way to buy a little house there! I've never been to Texas but it looks interesting. I love the basket full of veggies. Must be from the farmer's market. I'm going to try and visit Texas. My husband and I are looking for a new place for new adventures! We moved to Houston almost 5 years ago and when so many people started telling us about this quirky amazing place called Marfa I was intrigued! I'm sad to say we still haven't been but your post has re-inspired me to make it happen. It looks like such a unique place in the world. So glad you and your family enjoyed the trip! I've always wanted to go there! Looks like you had a very cozy time!